Hello. I hope everyone's day is much brighter than mine. I mean that in a physical sense since there's a storm going on here. Brandon and I moved into this apartment over a year ago and around this time last year, there was a storm. In the middle of the night, I heard a huge crash right outside our window; a big tree branch had fallen and hit our balcony. No damage, just scared. This morning, I heard the same crash and it turns out it's the same tree but a bigger branch! The wind's howling, the raining is pounding and my windows are shaking. Hopefully all the other branches will stay on the tree for the rest of the winter. On a brighter note, I wanted to share a few photos of Mini with his towel friends. 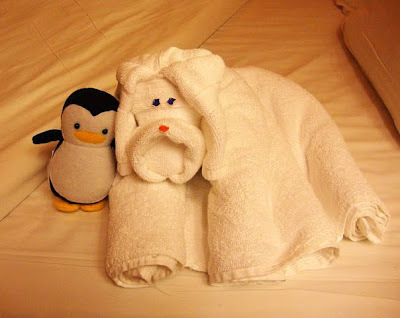 Towel friends are creatures made by folding and rolling up towels. 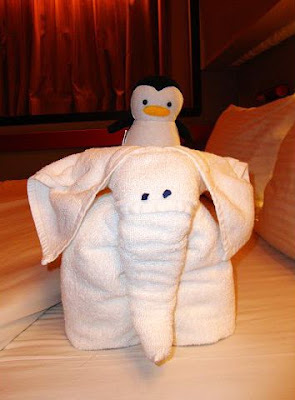 They're usually sitting on your cruise cabin bed waiting for your return. I was pleasantly surprised the first time I came back to the cabin after breakfast and found one. I tried figuring out how they made it but gave up since I couldn't roll it back into its original form. From then on, I was excited to find out what animal would be greeting us. Can you guess what each animal is? I think these were the easier ones... I had a hard time figuring out what other ones were, which is why I probably didn't take a picture of them with Mini. 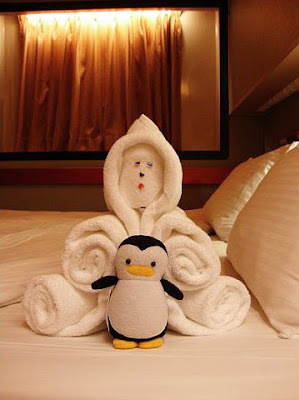 :P Oh, and one of our friends said he got a towel monkey hanging from a light fixture! Sorry, no photo of that. PS. B, I couldn't find that ONE shot of Mini and the ocean background.